UN Secretary General Antonio Guterres, who had visited India in July 2016 before he was elected Secretary General, made his maiden visit to India from October 1 to October 4. Ahead of his visit, Guterres told media that India is an important partner of the UN in countering terrorism and preventing violent extremism, and that there are plans to step up cooperation between the UN and India for strengthening capacity in combating terror financing. He appreciated India's support to his proposal to reform the UN Security Council and expressed hope that the progress will continue to be made to make the world body reflect the current global realities. During his visit to India, he participated in the Mahatma Gandhi International Conference on Sanitation - which marked the beginning of events to mark the 150th birth anniversary of Mahatma Gandhi falling on October 2, 2019. Secretary General of the United Nations, Antonio Guterres calling on the President, Ram Nath Kovind, at Rashtrapati Bhavan, in New Delhi on October 3, 2018. 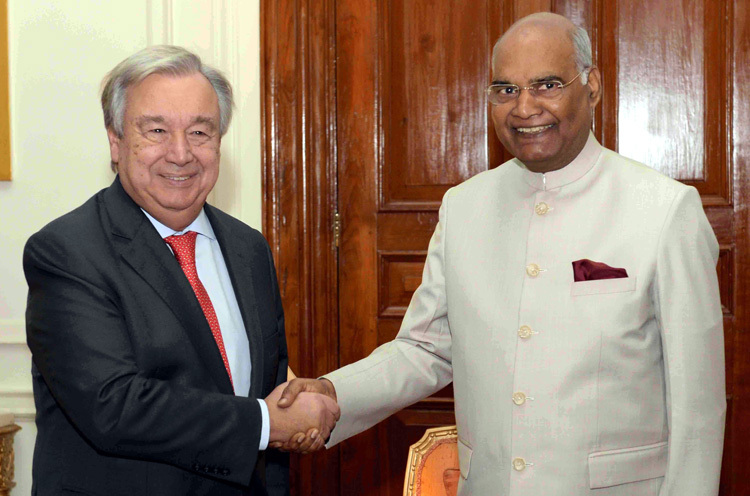 Guterres called on President Ramnath Kovind and met Prime Minister Narendra Modi, with whom he had high-level meeting to discuss wide ranging issues on key global issues including UN reforms, sustainable development goals (SDG), challenges of climate change and terrorism. He also met EAM Sushma Swaraj, Lok Sabha Speaker Sumitra Mahajan and other leaders. Guterres participated in the second re-invest and first assembly of the International Solar Alliance, and energy ministers meet of the Indian Ocean Rim Association member countries, attended the ‘Champions of Earth’ Ceremony, delivered a lecture at India Habitat Centre on ‘Global Challenges, Global Solutions’, and visited Golden Temple - which he had also visited in 2016. Speaking at the inaugural ceremony of UN House, Guterres said India is now becoming a global power, and is batting for a comprehensive approach towards comprehensive development, and that UN should work with India, support its development plans, and back its leadership with regard to climate change and sustainable development goals. He lauded India by saying, “India is becoming a fundamental pillar of multilateralism, and at the same time, as we want a multipolar world, it is impossible to build a mutipolar world without a very relevant role for India”. In an interaction organized by the UN office in New Delhi, Guterres denounced terrorism as a plague that affects the world. With no consensus on the definition of terrorism in the UN, he said while there is zero tolerance towards terrorism, defining the term has been a complex problem. 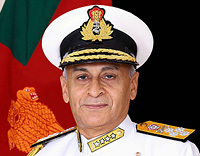 He said the definition of terrorism had not yet been coined, adding, "It is true we never managed to have a true convention because of the definition.” India, having proposed the CCIT (Comprehensive Convention on International Terrorism) to the UN, had raised the issue of definition at the recent UNGA meet. Guterres said UN fully supports India on this. 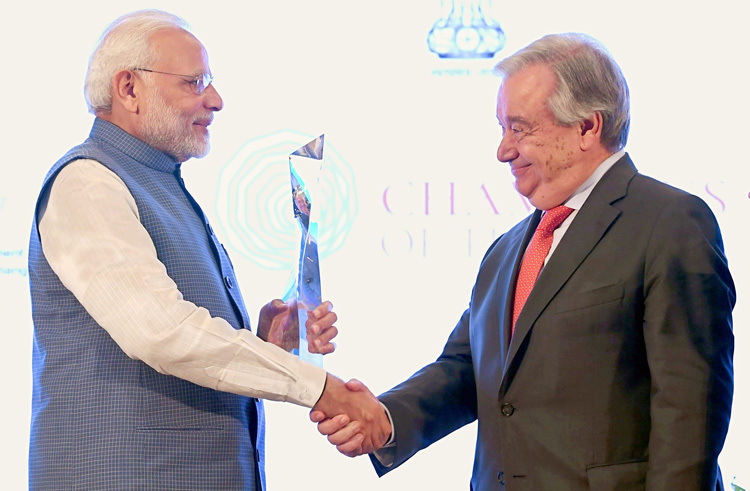 Prime Minister, Narendra Modi being presented the “Champions of The Earth” award by the Secretary General of the United Nations, Antonio Guterres, at a function, in New Delhi on October 3, 2018. When questioned about the mischievous and grossly biased UNHCR report on Kashmir authored by High Commissioner of Human Rights Zeid Ra'ad Al-Hussein, Gutters parried contents of the report by saying, "The HRC is an autonomous area and I don't discuss their reports. They have their own High Commissioners who play their role, and countries can disagree with them. Countries can choose not to accept their reports. 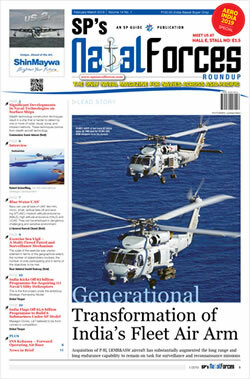 We need to respect the independence of their mandates." Noting India’s diversity, he lauded India’s religious harmony saying, "Like in any other part of the world, India too has some forms of extremism, but I think the major problems it faces are from poverty and inequality. My wife was born in Goa, and I am amazed by how there is perfect inter-religious harmony, which is the prevailing Indian tradition, and it is something India should cherish and preserve." Post delivering his talk on 'Global Challenges, Global Solutions' at India Habitat Centre, Guterres called on India to support Bangladesh in the Rohingya humanitarian problem and pressure on Myanmar for reconciliation and create conditions for these refugees to go back. Antonio Guterres has proposed reforms in three key areas: peace and security architecture, UN development system and management. 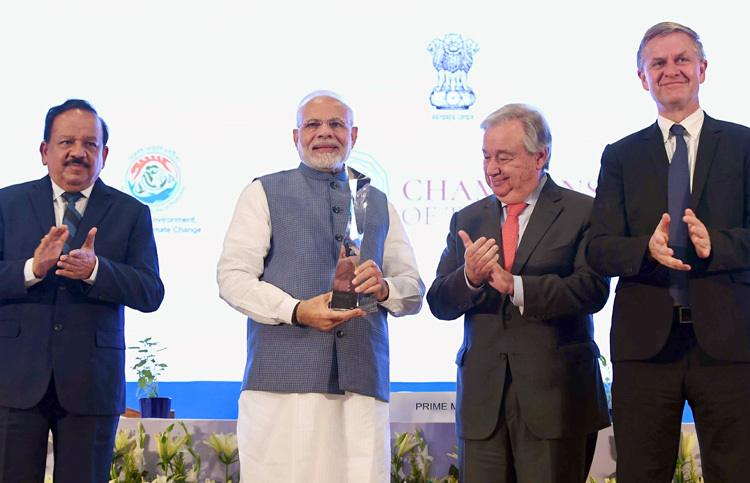 Prime Minister, Narendra Modi being presented the “Champions of The Earth” award by the Secretary General of the United Nations, Antonio Guterres, at a function, in New Delhi on October 3, 2018. Union Minister for Science & Technology, Earth Sciences and Environment, Forest & Climate Change, Dr. Harsh Vardhan is also seen. India, Japan, Brazil and Germany have calling for the reform of the UNSC including expansion of both permanent and non-permanent categories of membership to enhance its legitimacy, effectiveness and representativeness. But in the overall context, UN remains very relevant but does not have much power even within. One example is the mischievous and biased reports by the UNHRC which clearly indicates radical islamists leanings. Brushing them under the carpet by describing HCR as “autonomous area” is one thing but if the UN Secretary General can’t vet and intervene in such reporting, the why permit HCR the prefix ‘UN’? The definition of terrorism is another issue which doesn’t appear will get resolved in the foreseeable future, without which the CCIT will remain to be a proposal only. Besides, there have been instances of China bribing UN officials and using her economic and diplomatic clout to force the UN downplay her human rights abuses against Muslims, Tibetans and Christians over the years. Such issues merit attention by the UN Secretary General.